"Mortgage rates declined a fair bit this week, as investors refocused on global economic troubles and the words and deeds of central bankers around the globe. Even as economic data continue to show that modest U.S. economic expansion continues, doubts remain that it is durable enough to continue in the face of considerable worldwide headwinds, or strong enough so as to be an engine to help lift the world from its malaise. Certainly, many central banks are employing novel approaches to try to spark growth in their economies, but so far the only success story to be seen is here. Much as it might like to, the Fed cannot lift interest rates as desired, at least not without causing the kind of market-disrupting outward ripples we endured in the aftermath of the Fed's small move to the Federal Funds rate back in December. That move -- and plans for as many as four more this year -- so unsettled markets that the Fed was forced to back down its expectations for lifting rates in 2016 from four moves to two. As they usually do after tumultuous periods, markets settled, and now, with Fed policy de-tuned, there aren't any immediate rate changes for which to plan or hedge. The Fed is watching the data for clues, the market is watching the Fed for clues, with both reacting accordingly when they come. At the moment, the Fed is "talking down" expectations for growth and rates by highlighting the risks and challenges the economy faces. This has helped mortgage rates to fall, but presents a bit of a quandary for the Fed's messaging to markets. The overall average rate for 30-year fixed-rate mortgages eased by eleven basis points (.11 percent), slipping back to an average 3.67 percent, its lowest value since May 2013. If financial markets are confused or caught off guard by the Fed, pity the poor homebuyer or homeowner who has to puzzle though these times. They see "The Fed Is Raising Rates" as a headline, and start to expect higher rates... only to find when they finally look, that mortgage rates are lower. Of course, this does certainly happen, most typically at the end of a Fed tightening cycle, where the markets interpret that the present level of short-term interest rates is so high as to start to choke off growth... and market interest rates begin to fall to reflect that happenstance. Now, to be sure, we are not at the end of the Fed cycle, and barely at the beginning, but the reaction by markets is much the same, especially in light of perhaps a current GDP rate of near zero (per the Atlanta Fed's running model). In essence, and nominal levels of interest rates be damned, Fed policy is perceived as "tight" relative to growth, and sufficient enough to inhibit this growth to a degree. If economic growth were 4 percent the December quarter-point rise would have meant little, but with an already subdued rate of growth, any additional monetary drag (no matter how slight) can have an outsized effect. With the margin for error so slim, it's crucial that the Fed's discussion of the economy strike just the right balance. It's a conundrum, all right, the repercussions of which we, and the Fed and other central banks and economies will have to endure. 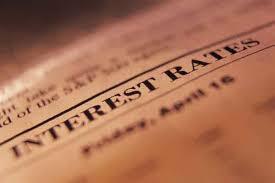 Mortgage rates dipped this week but firmed just a touch on Friday. New economic data due next week include retail sales and the Fed's survey of regional economic conditions, producer and consumer price indexes an a few other items. We'll probably see rates edge upward by couple to a few basis points"